ROSLEE: Please be informed that I hereby resigned from my position in the party effective immediately. KUALA TERENGGANU: Another UMNO assemblyman, Bukit Besi state assemblyman Roslee Daud today announced that he had quit the party to become an independent assemblyman. Roslee, who is also State Rural Development, Entrepreneurship, Cooperative and Consumerism Committee chairman, in a copy of a letter dated May 13 faxed to Bernama today, said: "Please be informed that I hereby resigned from my position in the party effective immediately." Earlier today, Kijal assemblyman and former Terenganu Menteri Besar Datuk Seri Ahmad Said, together with Ajil assemblyman Ghazali Taib, also declared that they had quit UMNO and became independent assemblymen for their respective state constituencies. Ahmad also resigned as Menteri Besar yesterday and was immediately replace by State Science, Technology and Innovation, Energy, Green Technology and Water Committee chairman Datuk Ahmad Razif Abd Rahman, who took his oath of office before Sultan of Terengganu Sultan Mizan Zainal Abidin at Istana Syarqiyyah here at 9.18 pm. 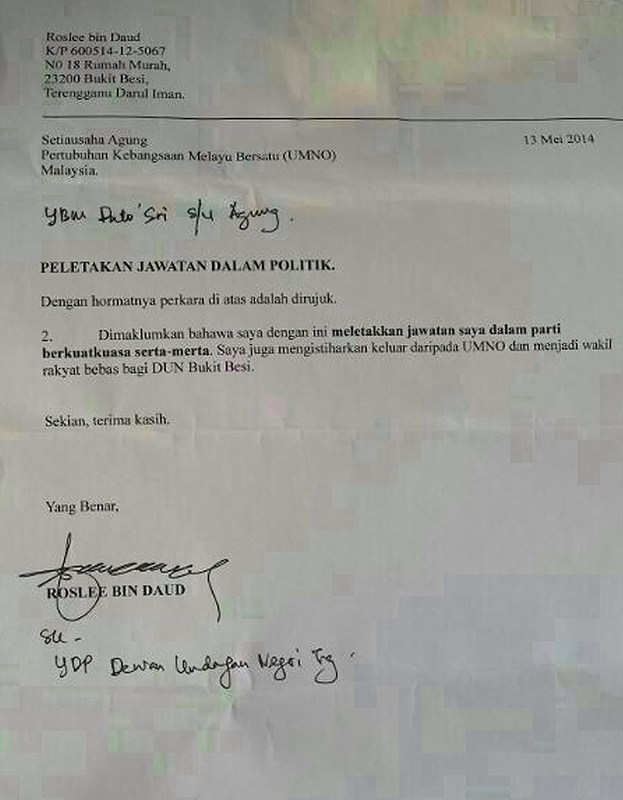 Roslee's letter was addressed to UMNO secretary-general Datuk Seri Tengku Adnan Tengku Mansor and was courtesy copied to the State Assembly Speaker. With Roslee's decision to join Ahmad and Ghazali as independent assemblymen, Barisan Nasional now left with only 14 assemblymen in the State Assembly, one short from the opposition pact as PAS also has 14 seats and PKR, one.